Polycom RealPresence VideoProtect 500 - Video conferencing kit - 22 in - with EagleEye Acoustic CameraGovernment agencies and corrections facilities need to provide citizens services and protect public safety. The Polycom RealPresence VideoProtect 500 solution is a safe, secure video conferencing solution that delivers local services to citizens no matter where they are located, and minimizes the need to transport inmates for court appearances, arraignments and other judicial interactions. This solution utilizes a Polycom RealPresence Group 500 codec and is designed to protect the video and audio system when the application requires the unit to be placed in a public or harsh environment. Polycom RealPresence Group Series solutions deliver a breakthrough user experience, ease of use and the lowest total cost of ownership. The enclosure is a ruggedized shield that can operate in a multitude of call scenarios from auto answer to auto dial with a simple lift of the built-in handset. From remote citizen services to video arraignments, the potential applications are endless. Now you can experience the superior Polycom HD Voice and video you've come to expect from Polycom with the protection and flexibility you need. The VideoProtect 500 is a key element of the total Polycom visual communication solution, which includes seamless integration with the Polycom RealPresence Platform. Government agencies and corrections facilities need to provide citizens services and protect public safety. 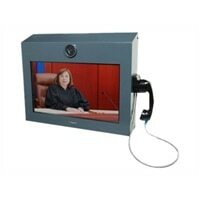 The Polycom RealPresence VideoProtect 500 solution is a safe, secure video conferencing solution that delivers local services to citizens no matter where they are located, and minimizes the need to transport inmates for court appearances, arraignments and other judicial interactions.